A significant collaborator in combatting some of Taos’s most significant threats – fire, water quantity and quality, forest health – The Rocky Mountain Youth Corps (RMYC) uses conservation-based projects as the classroom for personal and professional development and training. Specifically, for the last 10 years, RMYC has had a significant impact on the forests of New Mexico, and in Taos County, by deploying crews to undergo thinning activities with the goals of restoring the diversity of flaura and fauna, reintroducing fire into the natural process, preventing catastrophic crown fire, educating the public about the role of fire, and providing fire wood for low income residents. to preserve the environmental, cultural and historical integrity of the NM region. RMYC is clearly a stepping stone to new opportunities. It’s inspiring young adults to make a positive difference in themselves and their communities. Through training and team service, corpsmembers discover their potential for healthy, productive lives. Furthermore, they are a major area player. They have been contributing to the Taos County Wildfire Protection Plan, collaborating with the Taos County Watershed Alliance, and are a signatory of the Rio Grande Water Fund. Participation in these collaborative efforts are key to building comprehensive strategies to combat some of Taos’s most significant threats. In addition, they partner with many area non-profits, including the Taos Land Trust to build cohesion and community wide support for land conservation. Louis Bacon and The Taos Ski Valley Foundation, an affiliate of The Moore Charitable Foundation are proud to support RMYC this season. We hope you will too. Learn more about RMYC here. P.S. – A call to eligible youth: We noticed on their website that RMYC is now hiring young adults to serve on their spring conservation crews in both Taos and Albuquerque starting in March. Crew members will earn First Aid and CPR certification, project-specific training such as Forest Worker Safety Certification or backcountry skills, as well as a number of other professional development topics. Benefits include a living stipend and an Education Award upon successful completion of the program. Learn more about the opportunity for graduating students, students who have recently obtained a GED, young adults interested in conservation work, students transitioning to the workforce, or anyone looking for a meaningful experience with a group of peers here. The Moore Charitable Foundation and founder Louis Bacon are focused on forest health nationally and the advancement of prescribed burning as a critical management strategy, in partnership with experts in the field such as The Nature Conservancy and Wilderness Workshop. 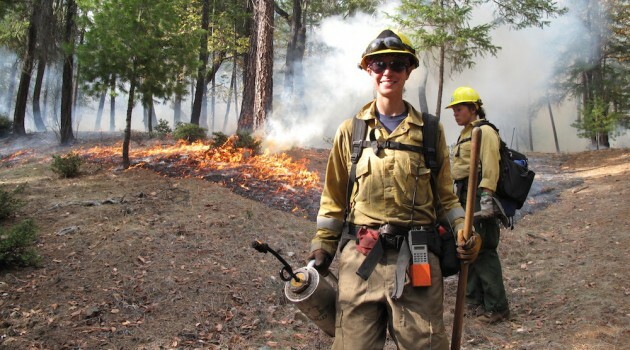 Like all areas of conservation, the future of fire practice could benefit from a more diversified workforce – including women in the mix as well. We are delighted to promote a great blog post published via Fire Adapted Communities by Lenya N. Quinn-Davidson, Director of the Northern California Prescribed Fire Council, about a prescribed fire training exchange (TREX) in northwestern California, hosted by the Northern California Prescribed Fire Council. This year’s theme: Women in Fire. Read on. To learn more about WTREX or to apply, visithttp://www.norcalrxfirecouncil.org/wtrex-2016.html. Contact Lenya at nwcapfc@gmail.com if you have questions. Eriksen, C., Gill, N. and Head, L., 2010. The gendered dimensions of bushfire in changing rural landscapes in Australia. Journal of Rural Studies, 26(4), pp.332-342. Eriksen, C., 2014. Gendered risk engagement: challenging the embedded vulnerability, social norms and power relations in conventional Australian bushfire education. Geographical Research, 52(1), pp.23-33. Langlois, K. May 30, 2016. Trial by Fire: women in the male-dominated world of wildland firefighting still face harassment, abuse and sexism. High Country News.